Balance Bike or a Scooter? Which One Should I Get? My son had a balance bike for his second birthday and a scooter for Christmas when he was 21/2. So should you get a balance bike or a scooter for your 2 or 3 year old? Well, my son had both and I don't think there is a right answer to this question. They will get something out of both a balance bike and a scooter. However in this article I will share with you my son's experiences with a scooter and a balance bike, what I personally think of each one and the advantages and benefits for both. My son had a balance bike for his second birthday. It took him a couple of months to really take any interest. But when he did he loved it and was zooming around. We couldn't get him off. He would want to take his bike everywhere he went, to the park, to his Nan's house, to his friends, on the school run, to nursery. He loves the balance bike, so he will love a scooter too... Right? He loved his balance bike so much I figured he would love a scooter too. So for Christmas when he was 2 1/2, I bought him a scooter. The thing is he loved his bike so much, it took a real effort to get him to have a go on the scooter. The bike always came first and was always the first choice. I had to really encourage him to use his scooter in the beginning. Wheras his older brother (who had a scooter before a bike, always preferred a scooter when he was younger). Now he loves his scooter and his balance bike. However, the balance bike is the favourite. I don't think this is because balance bikes are better in any way. I think that he found the balance bike easy and fun so in the beginning using the scooter took more effort for him. I think that if we had got the scooter first, he would have loved that more. But it's something to bear in mind when choosing whether to get a scooter or a balance bike. Generally a scooter will be lighter than a balance bike. Although this will depend very much on the brand of scooter and balance bike that you buy. The mini micro deluxe scooter weighs 1.8kg whereas the strider balance bike weighs 2.4kg. Most balance bikes weigh more than the strider. A scooter is easier to carry when he kids no longer want to scoot around. Having said this you couldn't get my son off his balance bike so I didn't have to carry it much. But on the occasion I did, it was certainly heavier! There are occasions where you might have to carry a balance bike and a scooer like when you are going uphill. It's hard on their little legs to get that balance bike up a steep hill. If you live in a hilly area, as a scooter is lighter to carry it might be the best choice! ​Although on both the balance bike and the scooter I would be very careful about letting them go down hills. They can get up a tremendous speed which can be extremely dangerous. 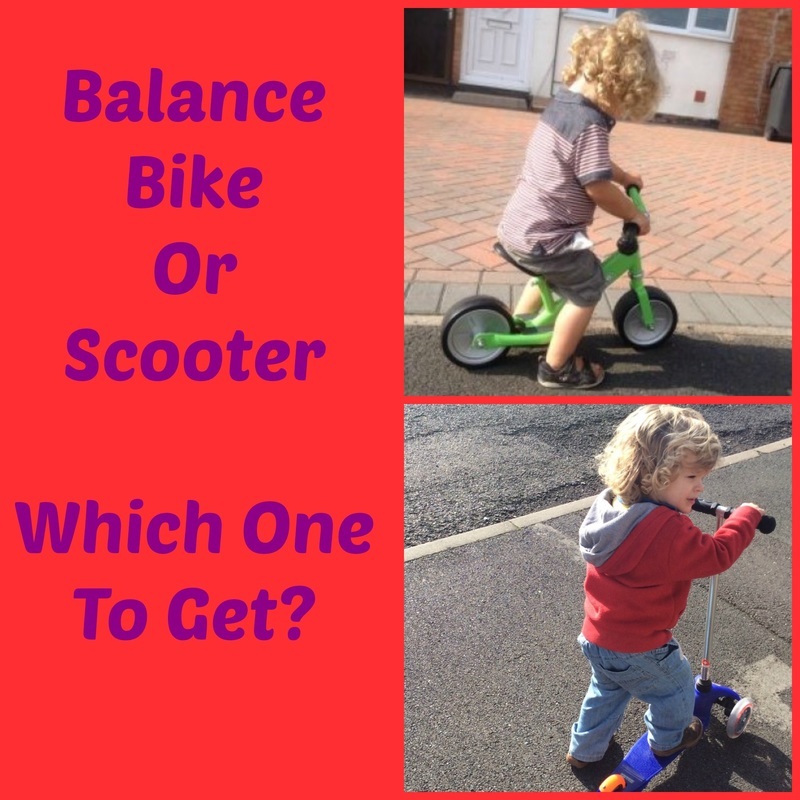 Parents will often say my child preferred a balance bike or a scooter but quite often it could be because they didn't buy the right sized balance bike or scooter for their child. Many people make the mistake of buying a balance bike which is too big for their two year old. When a child sits on a balance bike their feet must be able to touch the ground. They use their feet to push them along so if they can't touch the ground, they can't use it. If you are buying for a 2 year old, the strider bike is a fantastic option. It's small enough for little legs to use. My son had a bike for his second birthday and he used it constantly for 2 to 3 years until he grew out of it. The same goes for a scooter. A child will be much more inclined to use a scooter if it's the right size for them. The handlebars should come up to around waist high. Any higher and it will be difficult to control. Any lower and the user will be hunched over. For young children (around 2 years old) I really recommend the mini micro scooter deluxe (the lowest height on this scooter is 44cm which makes it easier for little children to control. Another thing to be aware of is the steering on a scooter and a balance bike. My son's balance bike had traditional steering where you use the handles to steer the wheels in the right direction. In contrast, the mini micro scooter has a lean and steer mechanism, where you lean to the left to turn the scooter to the left and lean right to go right. As my son got used to his balance bike first, it did confuse him a little bit when he first started using the scooter as the handlebars didn't control the wheels and you had to lean to steer the scooter in the right direction. He did get the hang of it fairly quickly but in the beginning it did confuse him. When they get tired both a balance bike and a scooter have an advantage. On the balance bike, their legs get a rest as they can sit down and just cruise for a while. I think another reason why my son didn't ask me to carry his bike so much is that he could always sit down and just cruise when he was tired. When their on a scooter, if they get tired and you don't want to carry it, you can get straps which you can use to pull them along. Just attach the strap to one end of the scooter and pull with the other end. Check out the Scoot and Pull. Obviously both scooters and bikes are great. However I would say to be careful they don't get too reliant on either of them and that they do plenty of walking too. As I said, my own son loved his balance bike and he wanted to take it out everywhere we went. But as kids are still developing you have to ensure they do a wide range of activites and movement to make sure their muscles and bones are not overdeveloping in one area and not in another. For example, overuse of a scooter can result in one side developing stronger than the other side due to one foot being used to push you along. Balance bikes are great to get kids ready for the transition to a pedal bike. They are perhaps a better choice if you intend to commute long distances with your child (to nusery or school). Kids can go quite quick on them with little effort. Bigger, bulkier and heavier so harder to store and transport. Not easy to carry. Scooters are lighter and smaller and some fold up and so store better than balance bikes. They are perhaps a better option if you want to take it on public transport as they are lighter, take up less space and are easier to carry. Better for hilly areas as you may want to carry them when your child goes up and down hills. The lean and steer steering can make it confusing for them when they transition onto other rides ons or bikes with traditional steering which is controlled by the handlebars. Strider balance bike is an excellent choice for a first balance bike. The age recommendation is 18 months to 5 years. Mini handlebars and mini grips perfect for little hands. It's difficult to go wrong with the mini micro scooter for kids aged 2 to 5. Adjustable handlebar from 44cm to 69cm to accommodate most children between ages 2 and 5. Not foldable but stem can be taken out of the base for easy storage and transportation. Built to last. Each main part is either repairable and replaceable so scooter can be passed onto younger siblings or sold secondhand.